London: 7 August 2012 - ECR Minerals plc is pleased to provide the following update on activities at its 100% owned Sierra de las Minas gold project area in La Rioja Province, Argentina. “ECR remains busy on a number of fronts in Argentina. Most importantly, planning for the next phase of exploration at our El Abra gold prospect is well underway, and we are preparing for work at other prospects controlled by the Company such as Maestro Agüero. The beauty of Sierra de las Minas is that it contains a host of known high grade gold deposits, and while these mostly appear to be of relatively small size, the area may prove very suitable for our proposed strategy of mining multiple deposits and either establishing a central processing plant or sending parcels of material for processing elsewhere. ECR’s Sierra de las Minas project area hosts numerous historical gold prospects, many of which have returned high grade gold assays from surface geochemical sampling by the Company and by previous explorers. The predominant style of mineralisation within the project area is steeply dipping mesothermal quartz veins. Such veins frequently make attractive exploration targets given generally robust grades, simple metallurgy and often signiﬁcant strike and depth extension. It is typical for grades to change rapidly and mesothermal systems worldwide are characterized by a series of high grade plunging shoots which form along a controlling structure, whereby most of the gold endowment of the veins is hosted in a small percentage of the total vein volume. ECR’s major focus at Sierra de las Minas to date has been the El Abra prospect, which was the site of small scale mining in the early 1900s when a series of vertical shafts were sunk to depths of 10-30m to enable the miners to drift along the veins. During April and May 2012, ECR drilled 13 angled diamond drill holes for a total of 1,112m at the El Abra prospect. The best overall intersection of the programme was 3.9m downhole at 11.6 g/t gold including 0.2m at 109.1 g/t gold. Of 13 holes drilled three holes intersected very high grade gold mineralisation and four more holes intersected mineralisation grading in excess of 1 g/t gold. The remaining six holes did not intersect significant mineralisation but did intersect the host structures, reflecting complexity of vein morphology and structural control on grade distribution. High grades including 80.78 g/t gold, 44.98 g/t gold and 39.74 g/t gold were returned by surface geochemical sampling at El Abra during 2011. Many samples of lower but potentially economic grade were also obtained. The range of gold grades encountered by drilling and surface geochemical sampling also suggests a nugget effect that makes representative sampling a challenge. Any economic mineralisation at El Abra will likely be hosted in only certain sections of the veins, and identifying any such sections is ECR’s objective. This is in keeping with the Company’s stated exploration strategy at Sierra de las Minas, which is to work up small, high grade gold targets that may be suitable for early advancement to production. It appears based on work so far that the El Abra vein system has limited size potential, although further exploration is merited. However it is envisaged that any producing operation at Sierra de las Minas would combine feed from multiple prospects, either for processing at a plant constructed in the vicinity of the project area or for onward shipment to an existing facility. ECR’s representatives in La Rioja Province have been approached by a South American group interested in holding preliminary joint venture discussions with regard to Sierra de las Minas. There can be no assurance that these discussions will progress beyond the initial stage but the Company is open to joint venture approaches, whether for exploration or in relation to any future mining and processing activities, and whether over all or part of the project area. Application is being made to the provincial authorities in La Rioja for permission to undertake the removal from El Abra of bulk samples for test processing off site. This would allow confirmation of the metallurgical characteristics of the mineralisation as well as providing information on the continuity of grade in the target areas. On the basis of laboratory scale testwork completed earlier this year the metallurgy of the surficial mineralisation at El Abra and other prospects at Sierra de las Minas is believed to be benign and high gold recoveries are believed to be achievable. Accordingly a successful bulk sampling programme may be expected to produce a modest level of revenue, depending on processing terms. Work at El Abra by ECR has so far focused on known veins, and it is now appropriate to undertake a prospect wide programme of detailed surface prospecting to determine if the known veins have strike extensions and if any undiscovered veins exist. Further systematic surface geochemical sampling may also be undertaken. The presence of numerous historical shafts, adits and cross-cuts at El Abra provides a significant sampling opportunity without the cost of underground development. Inspection of the existing vertical shafts indicates that several are ﬂooded to within 10m of the surface. However, given that the shafts are relatively shallow, ECR plans to de-water the workings where necessary and sample the veins vertically down each shaft and horizontally along each drive in order to gain a better understanding of grade distribution and the structural control thereof, as well as vein architecture and continuity. The Company intends to complete this programme during September. A less extensive programme of underground sampling had been planned for earlier in the year, but did not take place due to difficulties establishing safe access to the workings. The currently proposed programme will utilise specialist consultants in order to surmount the problems previously encountered. Away from El Abra, of the numerous other gold prospects within the Sierra de las Minas project area the Maestro Agüero prospect is considered the most promising. Maestro Agüero is characterised by a 200m long, steeply dipping quartz vein 1-2m wide, with sheeted quartz veins common in the hanging wall over intervals of 3-4m. There is thought to be potential for a small bulk mining target and ECR intends to conduct a systematic surface sampling programme to better assess the prospect. In addition there are multiple prospects under the Company’s control that are yet to be subjected to first pass appraisal. Work to visit and appraise all such prospects is on-going. 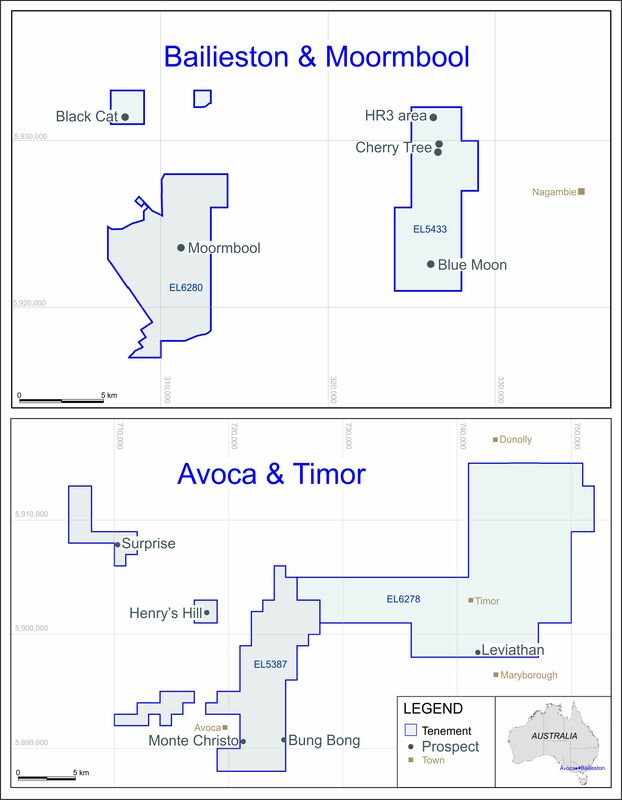 ECR holds 100% of the exploration rights to the Sierra de las Minas project area and 100% of the exploitation rights to a number of prospects within it, including the El Abra prospect. Exploration rights for other prospects may be converted to exploitation rights by application to the government of La Rioja Province. The El Abra prospect is subject to a 2% net smelter return royalty from production. In the case of exploitation rights, commencement of mining activities would be subject to receipt of the necessary environmental permissions from the provincial government. The project area is located approximately 800km north west of Buenos Aires and is the site of significant historical small scale gold mining. Access to the project area is possible via paved highways from the cities of Mendoza, San Juan and Cordoba. Local access is by paved and unpaved provincial routes. ECR is a mineral development company with 100% ownership of the Sierra de las Minas gold project in La Rioja Province, Argentina; a 21% fully diluted stake in THEMAC Resources Group Ltd (TSX-V: MAC), which is focused on the development of the Copper Flat copper-molybdenum-gold-silver porphyry deposit in New Mexico, USA to production; and stakes in West Wits Mining Ltd (ASX: WWI) and Paniai Gold Ltd (unquoted), both of which have interests in the Derewo River alluvial gold mining and exploration project in Papua, Indonesia. The contents of this announcement have been reviewed by Richard Watts B.Eng. Mining, Fellow of the South African Institute of Mining & Metallurgy, a non-executive director of the Company with more than 40 years of experience in the mining industry.